Mandarin orange is the most common among citrus fruits grown in India. It occupies nearly 50% of the total citrus area in India. Though, it is grown in every state, certain belts/ pockets have emerged as the leading producers. Nagpur Sangtra (mandarin) is chiefly grown in Satpura hills (Vidarbha region) of central India. Hilly slopes of Darjeeling (West Bengal) and Coorg (Karnataka) are other major belts or mandarin production. 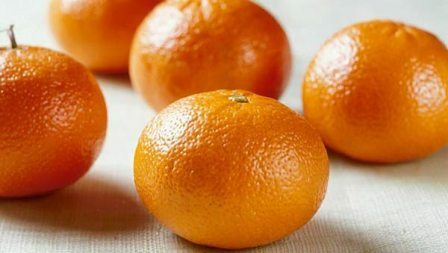 In north western India, Kinnow mandarin is being grown satisfactorily in Punjab, Rajasthan, Haryana, Himachal Pradesh, Jammu and Kashmir and Uttar Pradesh. In South India, Wynad, Nilgiri, Palney and Shevroj hills are major mandarin growing belts, while hills of Meghalaya (Khashi, Dusha, Garo, Jaintia), Mizorum, Tripura, Sikkim and Arunachal Pradesh have predominance in mandarins. In Assam, Brahmaputra valley and Dibrugarh districts are famous for mandarin production. Mandarins grow successfully in all frost free tropical and subtropical regions of the country. They are adapted well to sub mountainous tracts 370-1,500 m above mean sea level and temperature 10-35 C. In Karnataka, Tamil Nadu and Kerala, it is grown in humid regions of Coorg, Wynad, Nilgiri and Shevroy hills. In these regions, mandarin is not grown as a pure crop but is intercropped with coffee. In north eastern India, climate favours the production of excellent color and quality mandarins. The areas around Nagpur, with an elevation of 370 m and annual rain fall of 100-120 C provides and excellent climate for the cultivation of world famous Nagpur mandarin. Hot winds and excessive heat during flowering and fruit set are highly detrimental for fruit bearing and cause fruit drop and sunburn of the fruit. Low humidity favors colour development, whereas plants not having adequate sunlight produce low yields of poor quality fruits. The mandarins may be grown in a wide variety of soils but medium or light loamy soils with slightly heavy sub soil, well drained with pH of 6.0 -8.0 are ideal. In Nagpur area, mandarins are grown on typical black clay soil which cracks on drying. These soils are very shallow and are under laid with a porous subsoil of murrum. In Coorg and Wynad tracts of south India, mandarin flourishes sell in deep, well drained, black and red loamy soils. In Assam, mandarin is grown in valley land where soils are lateritic type of sandy loam with pH of 4.5 -6.0. In Punjab and its adjoining states, Kinnow is grown on alluvial soils with pH of 5.0- 9.0. In Himachal Pradesh, Kinnow and Desi Santra (mandarin) are grown chiefly in acidic literate soils (pH 5.5-6.0). 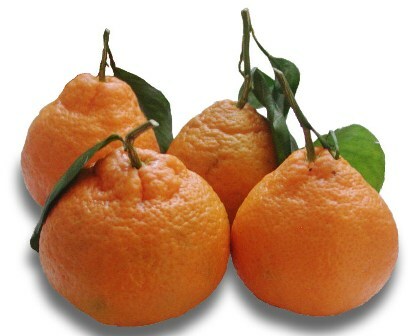 In India, specific cultivars of mandarins are cultivated in different regions. For example, Coorg mandarin is typical to Coorg and Wynad regions or Karnataka, whereas Nagpur mandarin is ideally suited of Vidarbha region. Similarly, Darjeeling mandarin, Khasi and Sumithra mandarins are basically adapted to Darjeeling, Khasi hills and Assam respectively. Of many exotic introductions, Kinnow mandarin has acclimatized very well in semi arid irrigated zones of Punjab and its adjoining states, and in Nagpur and Akola regions of Maharashtra. The most important commercial variety in south India, it is particularly grown on a large scale in Coorg and Wynad tracts. The trees are very vigorous and upright with compact foliage, sparingly spinous. Fruits medium to large, bright orange in color, oblate to globose in shape, base necked or depressed, rind thin to medium thick, easily peeled, segments 9-11; juice abundant; seeds 14-30, matures during February- March. Khasi is a commercially grown variety of mandarin in Assam, Meghalaya and north eastern states. It is locally known as Sikkim or Kamala mandarin. Its trees are medium to large with erect habit, dense foliage, both thorny and thorn less. Fruits depressed, globose to ovate, orange- yellow to bright orange, surface smooth, base even, occasionally short-necked, segments 8-10; abundantly juicy, juice orange colored; seeds 9-25. Occupying a premier position among Indian mandarins, it is one of the finest mandarins grown in the world. It is also known as Ponkan. The trees are vigorous, spineless with compact foliage; leaves narrowly lanceolate. Fruits medium sized, sub globose, cadmium colored, surface smooth, base slightly drawn out with glandular furrows; rind thin, loosely adherent; segments 10- 11; juice abundant, saffron colored; seeds 6-7. It matures during January- February. It is a first generation hybrid between King X Willow Leaf. First introduced in Punjab, it has performed well and gained commercial significance. Plants are medium to large, erect, symmetrical, dense foliage with a few scattered spines; leaves broadly lanceolate. Fruits medium, oblate, base flattened, deep orange yellow colored on ripening; rind thin, adherent to segments; 9-10, very juicy; seeds 12-24; fruit maturity in mid January; somewhat irregular bearer. Most of the mandarin cultivars are propagated through seeds except Kinnow and Nagpur mandarins. Usual practice in Coorg, Assam and other north- eastern hills is to use seedlings as planting material. But with concerted efforts made to find out suitable rootstocks for different regions, orchards have shifted to vegetative methods, particularly T-budding. For quality planting material, select uniformly matured fruits from healthy, true-to-type and heavy bearing plants to extract seeds. Freshly extracted seeds should be mixed with ash and dried in shade. Seeds should be sown immediately after extraction. Otherwise, they may loose their viability. Seeds are sown at a distance of 2-3 cm. germination may take place within 3-4 weeks. Since the seeds are polyembryonic, the sexual seedlings which are stunted and poor in growth are rogued out and the rest that are produced from the cells of nacelles are allowed to grow. The seedlings, thus, selected are more or less uniform in growth and production. Every care must be exercised to protect the seedlings in the nursery from weeds, insect pests and diseases. Seeds of identified rootstock for a particular area should be extracted from fully matured, healthy fruits. They are sown in lines (10-15 cm deep) on raised seed-beds inside a polyethylene house. About 1-2 months old seedlings are shifted to secondary beds. These are finally budded when they attain a height of 25- 30 cm and 1-2 cm diameter. Scion should be selected from healthy, vigorous, mature, virus- free and high yielding trees. They should also be free from water sprouts and chimeras. Further use of dormant scion bud wood from past season’s growth is used after it has hardened. The bud wood should be taken from round or cylindrical green twigs. Optimum time for budding varies according to the place. It may be done at a time, when there is free flow of sap and bark slips easily. In Punjab and adjoining areas, budding is practiced either in February-March or September-October, whereas in Nagpur and Coorg regions, September-November is the ideal time. Generally, planting is done during monsoon in all mandarin-growing areas. In sub mountainous tracts, where planting is generally done on slopes, proper terraces are necessary, while in plains the land should be leveled properly. Usually mandarins are planted in pits of 50 cm x 50 cm x 50 cm sizes in a square system with spacing of 4.5 m -6 m, accommodating 350-350 plants/ ha. In north eastern parts of India, Khasi mandarins are very closely (4.5 x 4.5 m) spaced, accommodating more than 500 plants/ ha. In Punjab and Haryana, a spacing of 5m x 4.5m is ideal for Kinnow mandarins budded on Jatti Khatti. 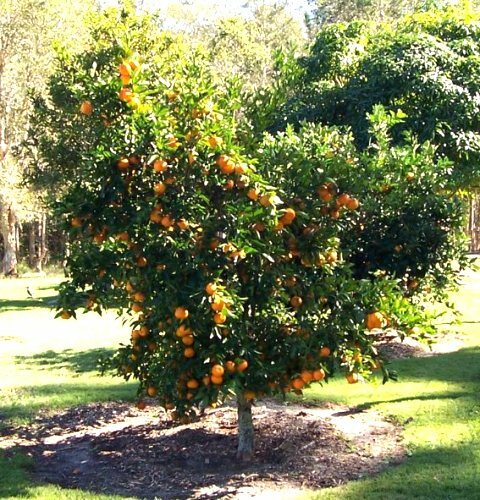 Kinnow can be grown successfully under high density planting by using Troyer citrange as a rootstock and by spacing the plants at 1.8 m x 1.8 m, accommodating 3,000 plants/ha. Under this system the plants become precocious, producing excellent quality fruits. The optimum planting distance for Nagpur mandarins is 6m x 6m when budded on Rough lemon. In Karnataka, Coorg mandarin on Trifoliate orange and Rangpur lime can be planted at a distance of 5m x 5m and 6m x 6m, accommodating 400 and 275plants/ ha respectively. An ideal mandarin tree should be low headed with a dome like crown. This can be achieved by pruning young trees. Pruning of young tree to give them proper shape and size is known as training. To give a desirable shape to the plant, pruning is restored to during initial years of planting. Trees are trained to single stem with 4-6 well spaced braches for making the basic framework. Further, the lowermost branches should be allowed not to grow below the height of 50 cm from the soil surface. The bearing trees require little or no pruning. Main objective of pruning the bearing trees is to maintain the framework and to secure higher yields with better quality fruits. Pruning of bearing trees though differs with variety but chiefly consists of removal of dead, diseased, criss- cross and weak branches. Removal of water sprouts and sucker of rootstock is also highly essential. Pruning of non-bearing trees can be done at any time of the year, but for bearing trees the best time is after harvesting, during late winter or early spring when these are in somewhat dormant stage. Root pruning is also practiced in some parts of central and southern India to regulate flowering season. However, such prunings are not beneficial in the long run. Under equitable climate of south and central India, mandarins bloom thrice a year. The February flowering is known as ambe bahar; June flowering as mrig bahar and October flowering hast bahar. Under such circumstances, plants give irregular and small crops at indefinite intervals. To overcome this problem and to get fruitful yield in any of the three flowering seasons, treating mandarin trees has been practiced in Deccan which is called resting or root exposure or bahar treatment. In this method, roots of the plant are exposed to sun by removing up to 7-10 cm soil around 40-60 cm radius of tree trunk. The water is withheld for a month of two before flowering. As a result of water stress, leaves show wilting and fall on the ground. At this stage the roots are again covered with a mixture of soil and farmyard manure and irrigated immediately. Subsequent irrigations are given at suitable intervals. Consequently, plants give new vegetative growth, profuse flowering and fruiting. However, in light new vegetative soils, exposure of roots should not be practiced and mere withholding of water for 2-3 weeds is sufficient for wilting and defoliation of trees. It depends upon the choice of the grower of as to which of the three bahars is to be taken to get maximum profit. As the availability of water is a problem in central India during April- May, the farmers prefer mrig bahar so that the plants are forced for rest in April- May and no water is required during this period. Plants put forth new vegetative growth, followed by flowering (July-August) and fruiting during the coming season. Mandarins, like other citrus fruits also require judicious application of mineral nutrients for proper growth, development and sustained production of high quality fruits. Mandarins also require micro nutrients—zinc, copper, manganese, iron, boron and molybdenum – in ample quantities but not sodium and chorine, which are rather harmful for mandarins. Improper supply of nutrients may cause serious disorders which may lead to orchard decline. 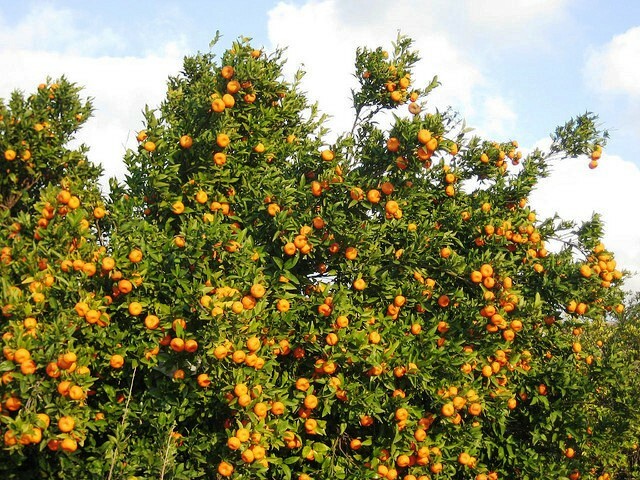 It is very difficult to recommend any single fertilizer schedule for mandarins as fertilizer requirement is guided by soil fertility, pervious fertilizer use, nutrients removed by crop, leaching losses and scion cultivar which is further modified by rainfall, temperature, stock- scion combination and age of the tree. There are no scientific recommendations on Manuring of young mandarin plants in India. However, application of 20 -25kg farmyard manure together with 0.4 kg calcium ammonium nitrate is recommended at the time of planting. A mixture of 90 g each of N, P, K/ tree may be applied in first year after planting. This dose may be gradually increased to 450 g each of N and P, and 900g of K/ tree in the seventh year and kept constant thereafter. Though the nutrient requirement of major elements is met by supplementing N, P, K fertilizers but farmers usually forget about micronutrients, which are the most essential part of citrus nutrition. Although each micronutrient has its typical deficiency symptoms but these are so complicated that it becomes very difficult for an orchardist to identify and correct these. Hence farmers are advised to follow the schedule given in Table1. The micronutrients should be supplied through foliar spraying. This mixture should be sprayed on major flush of the leaves expanded to at least two thirds of their normal size. Normally young plants are manure once a year, while bearing plants more than once. Total amount of P and K fertilizers is applied at one time, while N fertilizers are applied in two or three split doses. In north western India, manures are added twice a year, once during June and another after harvesting in December- January. In central India, mandarins are manure during December for ambe bahar and in May for mrig bahar. However, for Coorg mandarin, Manuring thrice (March- April, June-July and September-October) is highly beneficial. For soil application, first 30-40 cm area around the tree trunk should be given hoeing and fertilizers should be applied in the form of ring. They should be mixed thoroughly. The trees should be irrigated immediately. Growing additional crop not only provides additional income to the orchardist but it also checks weed growth, conserves soil moisture and prevents soil erosion. So, selection of intercrop is of utmost importance. The intercrop should be shallow rooted and short duration one. In the long run intercropping may not be profitable. However pea, cowpea and gram are beneficial intercrops in mandarin orchards. Excess or deficiency of soil moisture creates adverse effects on mandarin production. Irrigation requirement of mandarins is higher than other fruit trees because of their evergreen nature, active growth and development throughout the year. It depends on water holding capacity of soil, climatic condition, age of the plant and variety. In Tarai region of Uttar Pradesh, soil has high moisture retention capacity, thus lesser number of irrigations are required. However, in Punjab, Haryana, Rajasthan and parts of Andhra Pradesh, more number of irrigations are required. In south India, mandarins are grown under rain fed conditions in high rainfall areas. In winter season, mandarins should be watered at 10-15 days intervals, while in summer at 5-7 days. Since root activity of mandarins is confined to a radial distance of 120 cm and to a depth of 24 cm, too much wetting should be a avoided. Water stress during growth flowering, fruit set and fruit development should be avoided. Plants should be irrigated at 8-10 days interval, during drought (April-June in north India and October-December in south and central India). Mandarins are highly susceptible to water logging, therefore, stagnation of water around tree trunk should be avoided, and irrigation water should also be free of salts. Weeds are a serious problem in mandarin nursery and young plantations. Major weeds can be controlled by hand palling, hoeing, burning and tillage. However, frequent tillage may destroy the surface structure of soil, thus lowering the water holding capacity and permeability of soil. So better way to eradicate weeds is use weedicides. Pre emergence application of Diuron( 5kg /ha) or Terbacil (4.5 kg/ha) or post emergence application of Atrazine (5-6 kg/ha) controls weeds significantly. Further, Bromocil (6kg/ ha) is most effective in controlling both monocot and dicot weeds. Glyphosate ( 5 liters/ ha) is most effective in controlling perennial grasses. Simazine (5 kg/ha) is also highly effective. Picking of fruits at proper stage of maturity is paramount importance. Harvesting at right time not only maximizes profits but also helps build up the demand for quality fruits. Unlike climate fruits, mandarins do not improve in taste after harvesting. Therefore, fruits should be harvested when they attain full size, develop attractive color with optimum sugar: acid blend. Since mandarins in India are produced under varying climatic conditions, harvesting periods differ in different parts of the country (Table 2). Method of harvesting is very important as it affects the shelf life of fruits considerably. Further, faulty harvesting and rough handling adversely affect the marketability of fruits. The common commercial practice of harvesting is to pull the fruits from the branch, which may rupture the skin near the stem end leading to fungal infection and subsequent rotting. This practice should be avoided. Therefore, fruits should neither be plucked nor torn off, but should be cut off preferably with clipper, shears or secateurs. Generally, mandarins start bearing from the fourth year having 15-20 fruits/ plant. However, its plants attain the level of full bearing at the age of 10-12 years. Although mandarins may attain optimum maturity standard but the fruits may not be attractive at the time of harvesting due to lack of good yellow color. Accordingly, degreening of mandarins with the application of Ethrel (50ppm) one week before the actual date of harvesting has almost become a commercial practice in most of the developed mandarins growing countries. Further, fruits dipped in 50 ppm Ethrel after harvesting develop golden yellow color within 5 days of the treatment. 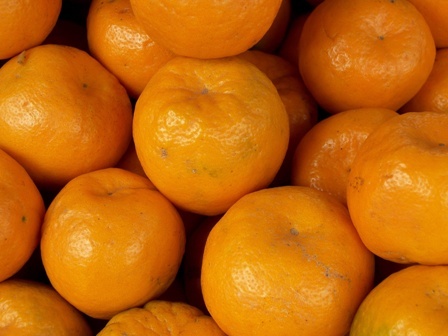 Generally mandarins are graded according to their size and appearance. Fruits are usually packed in wooden boxes for distant markets, while for local marketing baskets of split bamboo and mulberry are used. Chopped straw and dry grasses are mostly used for padding. The fruits should be cleaned and polished lightly with a piece of cloth, before wrapping them in tissue paper or newspaper. Use of corrugated fibre board cartons in place of wooden boxes is highly beneficial. Mandarins are generally transported by rail or road as ordinary cargos without refrigeration which often leads to heavy losses due to decay and fungal infection. Use of shrink films for moisture loss control can be useful. Storage life of mandarins is influenced by many pre and post harvest factors. Green or fully ripe mandarins can be stored successfully at 8-10`C with 85-90% relative humidity without impairing fruit quality. Similarly, Kinnow fruits can be stored at room temperature up to 3-4 weeks in perforated 100 gauge polythene bags having 0.5% ventilation area. In spite of very high initial flowering and fruiting in mandarins, the ultimate yield is often low primarily owing to heavy fruit drop. However, all fruits that fail to mature do not drop at one time but at different times. There are more or less definite periods or stages when extensive dropping occurs. In mandarins, the shedding of flowers and fruits come in more or less in three distinct waves. The first wave occurs soon after fruit setting, second during May- June known as June drop and third one known as pre harvest drop, i.e. the drop of mature fruits before harvesting. Fluctuating temperature, low atmospheric humidity, imbalance of soil moisture, lack of proper nutrition, hormonal imbalance, incidence of insect pests and diseases are some factors causing fruit drop. Accordingly, maintenance of appropriate soil moisture level during fruit development and application of growth regulators—2,4-D (10 ppm), NAA (5ppm), 2, 4, 5-T (5ppm)—check fruit drop quite effectively. Further, application or Aureofungain @ 20ppm helps in better retention of fruits through control of fungal diseases. It is a physiological disorder of juice sacs of citrus including mandarins wherein they become comparatively hard, assume a grayish color and become somewhat enlarged. The concentration of pectic substances increases, whereas there is reduction in juice content, TSS and acid content. Because of low sugar and acid content, the granulated vesicles become rather tasteless and colorless. Young, vigorous trees are more likely to develop granulated fruits than older ones. Similarly, large fruits have more granulation than small ones. In addition, granulation increases as the picking season advances. 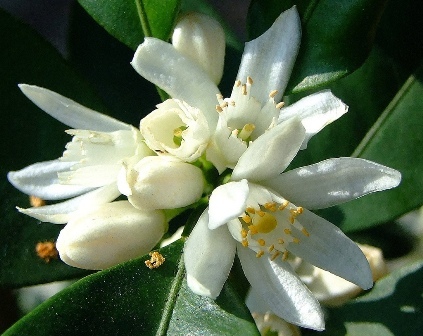 The incidence of granulation is highly specific to the type of the mandarin being cultivated. It is favoured by high relative humidity and temperature during spring. Spraying of lime reduces the extent of granulation. Reduction in irrigation also lessens its incidence. The applications of 2, 4-D (12ppm), zinc and copper reduces the incidences of granulation considerably. After fruitful production fro about 15 years, mandarin orchards start bearing little crop and become uneconomical. They show symptoms of ill health and decline. The affected trees do not die completely but remain in state of decadence and unproductiveness for a number of years. Initially, only a few limbs of the plants are involved but later whole tree is affected. Plants show sparse foliage, stunted growth, and sickly appearance and in leaves, mid-rib, lateral veins and intervenal area show diffused yellow color leading to ultimate shedding of leaves. As a result of dieback, twigs become short and bear only a few narrow leaves at their basal ends. Such plants are also characterized through excessive flowering and very poor fruit set. Unfavourable soil conditions (presence of hard pan, high pH, poor drainage and high salts), malnutrition, poor orchard management, indiscriminate use of fertilizers, intercropping, incidence of insect pests and diseases are major factors contributing to it. Good cultural practices, improvement in soil fertility and drainage, control of insect pests, nematodes and diseases may be useful to minimize its incidence. Use of resistant and compatible rootstocks and certified budwood for propagation are strongly recommended for a healthy and productive mandarin orchard.